The rear of the E22 is just as interesting as the front of the car, with the team utilising a Rear Wing support pylon that joins under the central section of the Mainplane but has a kink midway down and terminates on the left hand side of the Crash Structure. This is a 75mm offset and seems strange on it's own, but to marry this, the exhaust pipe also bends around 45 degrees as it exits the engine cover with it's outer edge residing roughly 75mm from the centreline too. It's been argued for some time by myself and other tech analysts, that due to the fact that the Turbo has the MGU-H attached to it, the amount of exhaust energy available for 'exhaust blowing' will be minimised in 2014 onwards. Could Lotus therefore be the first team visibly trying to invoke a performance advantage by skewing the exhaust? Lotus clearly have a specific intention in bending the exhaust where they have and most likely wish to make gains aerodynamically that others will struggle to replicate. Lotus must have completed their CFD runs modelling the whole car, to take in account the inconsistencies that asymmetry can produce and is further echoed by the teams use of other asymmetric parts. The regulations going forward put a much heavier restriction on the use of both CFD and Wind Tunnel testing to offset the return of in-season testing. This will undoubtedly hinder any teams wanting to assess the kinked exhaust concept as the computing power to process the whole car vs half of it is more than double whilst as we know replicating ballistic energy like the exhaust is altogether another black art. Interesting piece, especially that last paragraph: increasing the boundary layer and inducing more turbulent air to increase performance sounds counter-intuitive. Is it perhaps that due to this the airflow slows down, which is then easier manipulated by the upwash? Is it not simply a space and weight issue? In that the McLaren and Marussia Y-lon's are one way of attaching the pylon above the exhaust exit, and this is another. The E22 pylon is kinked over as far as it can go so as to still attach to the top of the crash structure, and the exhaust was then moved over enough to evade the pylons position. Could the heat of the exhaust bend the pylon to achieve a change in the rearwing, when the car is going slow or fast? 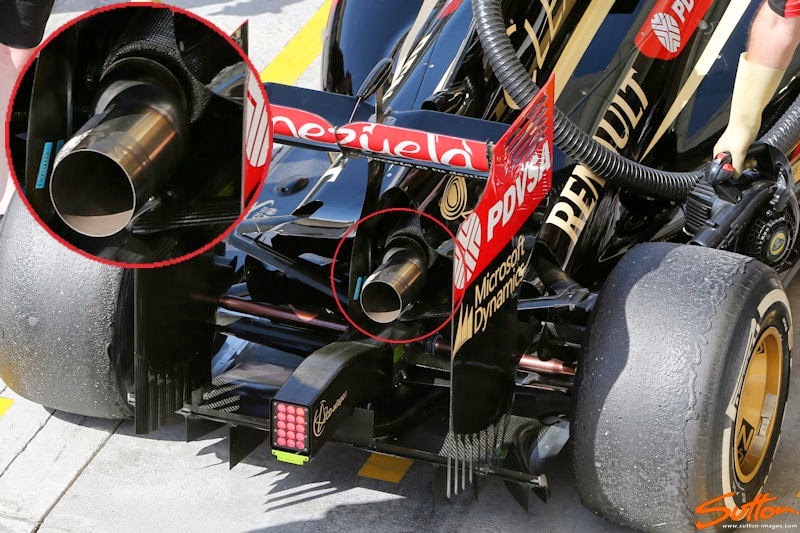 Has Lotus changed during these 4 days the position of the exhaust? The first day was not in the center of the car, but in the picture of your article does seem centered. Is this correct or am I wrong?